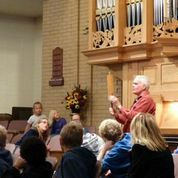 Pedals, Pipes, & Pizza is a partial-day event designed to give children and youth a brief introduction to the pipe organ and its music. The Utah Valley chapter hosts this event each year. Please contact us at: gro.o1556217498gavu@1556217498ofni1556217498. We will be happy to assist you.